Well it has been a busy week. Lots of four-hour hospital runs for my dd who has just been diagnosed with type one diabetes: a stinking cold (probably caught from hospital lol) and slow work renovating our victorian sitting room. Despite all this it has been a very productive time stitching wise. 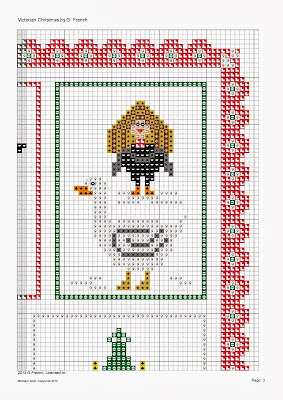 My second Scrooge ornie will be released early next week and matches the freebie given here and on my fb page perfectly. A before and after if you like. I have also been busy stitching on another new release which will be out at the end of next week! Busy fingers indeed! I am up to date with my Christmas SAL and am loving it. Excuse the photo: the grey and wet and miserable weather here gives washed out photos even with the daylight lamp on full blast! So, let me explain a little about the motifs I have used. Well, there had to be snowman: Victorian Britain was extremely cold and snow was something we would have had in plenty. I am sure as soon as the snow began to fall, children would play and build their snowmen and throw snowballs. I am also pretty sure the novelty would wear off quite soon! Remember, there was no central heating in those days! Just coal fires and wood fires. And to make things worse, Britain was just coming out of something call the 'Little Ice Age'. 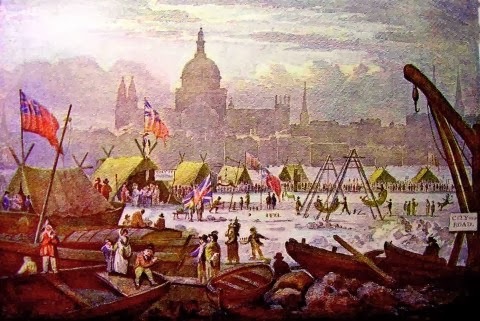 It would get so cold the River Thames would freeze over and in 1814-15 a 'Frost Fair' was actually held on the Thames. If you were rich you would have maids to get up early on your behalf and light the fires, and you would wear furs and cloaks. Sadly, the majority of people were poor and these were luxuries not available to them! Hygiene wasn't very popular in those days so children would be sewn into their winter clothes. Entire families would sleep together to keep warm and overall, I am sure the snow would become a burden quite soon! So of course you need to have a fireplace. The one I have used in the design is as close to my own Victorian fireplace as I can get. I'm looking forwards to getting into my sitting room and sitting by the fire stitching...the minor renovation work has grown though as hubby keeps finding more to do and work is slow with all the hospital runs etc. So I guess I will have to wait a little while. We all associated Christmas with turkey but this wasn't always the case. The traditional bird was the goose. Geese would be walked from Norfolk and Essex (but the Norfolk ones would have been best) to London before Christmas, given a little time to fatten up from their journey and there you would have your Christmas dinner. As I come from Norfolk, of course there will be a little bias towards those geese! Little shoes would be put on the geese or their feet dipped in tar and sand to help them walk the 100 miles or so to the London markets. 'Goose clubs' would be set up and people could save little money each week to put away for their goose. Turkeys were a luxury bird and are only popular today for one reason. They can be easily factory farmed. The supermarket mass produced turkey is nothing like the traditional turkey anymore sadly. They suffer a lot of ill health and are bred to get as fat as they can as quickly as they can, which leads to joint problems. Even if farmed free range, these issues still exist so if you are an nice person, go for a free-range older-breed of turkey which tend not to suffer from these effects and have had a happy, healthy life. I tried to rear both: the modern breeds suffer no matter how free range and loved they are. It's very sad! Geese are now a luxury bird simply because it is impossible to rear them in a factory. They have to be free range and good for them! I keep geese but we no longer rear them to eat. They are loyal, great guards (they make a lot of noise if someone strange comes around) and will 'adopt' and care for young that are not their own. They are amazing birds but because of this we no longer eat them. So there you are: the explanations behind the motifs used so far. Afterall that I guess you would like to see the chart! Please note, the colour chart has been updated on the SAL page. I love geese so much...so cute..
Great history lesson given and noted! Thanks! It's hard to ever imagine the thames freezing over now! I guess we should be grateful for our radiators and insulation! Beautiful progress on the Christmas SAL. Such a sweet design. Sending you prayers and hugs! Love the latest installment. And thanks for the back story. Take care and sending good thoughts. Can't imagine the Thames freezing over these days, although it would be nice to have a skate on a frozen pond like they used to.